15 x 17 cm  p. : chiefly col. ill. Reprint. Originally published: London: Viking, 1981. Board book. PEEPO! has become a classic for babies and toddlers. It follows a baby through the day in a style full of wit, charm and ingenuity. A series of holes peeping through to the next page leads the child on to the next stage in the day, giving a hint of what is to come. 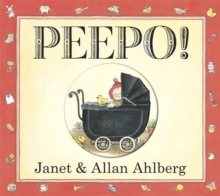 An original book that has long delighted young children - and their parents!